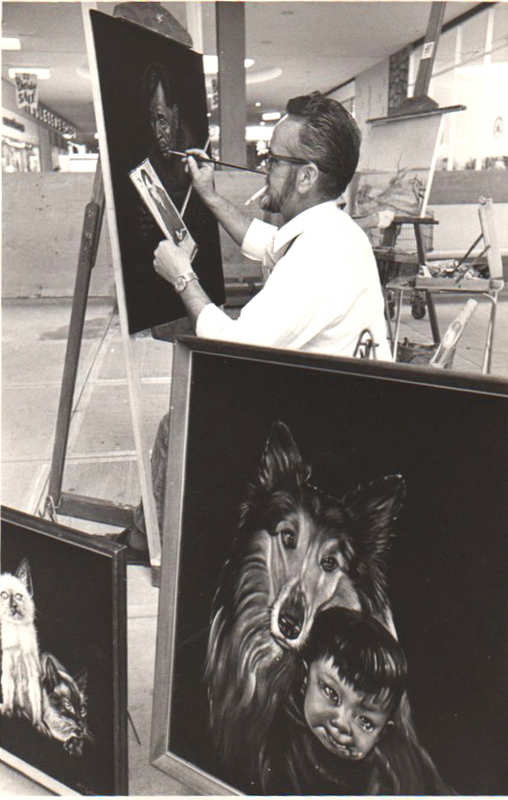 My husband had stopped painting years before I met him due to an unfortunate incident that is better left unknown. I had been trying to get him to paint again, but with work, there was little time left for that. After we started our own sign business I would say “I’ll paint that plywood… you go paint a picture!’ And he started to do what he loved to do. After a while, I started taking his paintings out on shows, but he wouldn’t go near them. Finally, Brentwood Mall had a competition, “An Invitation To Art.” The public were to pick the winner by their votes. You had to paint your entry there, in the mall. If you entered the contest, you were allowed to show (and sell) your paintings. He was very nervous that first time, but he did it. He did a painting of August Jack Hautsilano, the painting discussed in a previous post, and he won second prize! One Hundred Dollars! Thanks for coming and commenting Carol Ann…. and blessings to you, too. I do appreciate your comments. Good morning, Norma. 🙂 Great story….I love the photo of the cheque receipt. I have one too – from the first time my computer art was published in a big fat glossy magazine (A+)…. that no longer exists. That was a special gift you gave Mickey – you gave him back his own gift, his passion. Good afternoon Heather. I hope you grabbed a cup of tea as I wasn’t around when you came by. Were you out playing in the snow? Thanks for your comment… always appreciated. Wow! His work is amazing! A God given talent.And you Norma gave him back his passion to return to what he loved. Wonderful story my friend,Have a great day & thank you for the tea.Keep shining! Hi Dianne. Thanks for your visit, and I hope you are still enjoying tea at my home! The cookies were pretty good this morning… home made. Thanks for your comments. I do appreciate each one. See you on Friday?